Following HP 940 or HP 940XL ink cartridge installation, your printer/computer may show “Low Ink” or “Empty” messages. Press ‘OK’ to dismiss this prompt and resume printing. Additional alert messages, such as “non-genuine cartridge”, “counterfeit, or “fraud” may also be displayed. Press ‘OK’ or ‘Dismiss’ to bypass these prompts. 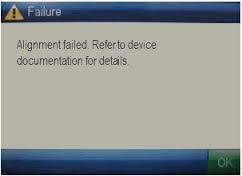 For other error messages, see below. Refer to important NOTE at bottom of page regarding the use of non-genuine/original ink cartridges. 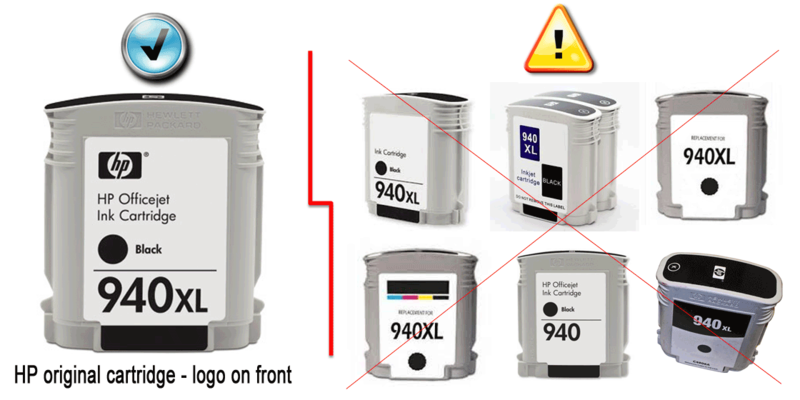 NOTE: “Empty” and “Low Ink” alerts are COMPLETELY NORMAL for original/genuine HP 940 & 940XL ink cartridges which have been refilled! While at first this may be an unusual workflow, it does allow print operations to proceed. After refills, the printer cannot track the ink level. The ink level indicator will falsely signal empty. Continue to print until the print quality fades. When the cartridge ‘truly’ is out of ink the printer will stop printing and display a ‘replace cartridge’ error message or similar. NOTE: there is a sensor within the base of the cartridge that detects the presence of ink. If any streaks or missing colors appear on prints the cartridge may be suffering from an air bubble within the internal ink spout. Initiate a “Clean Printhead” procedure, via the printer control panel Setup/Tools or Maintenance menu. You may need to activate it 2 or 3 times to reprime the ink port and PRINTHEAD. If you cannot identify which color cartridge is empty, print a test page via: 1) your printer control panel or 2) via the “Test Prints” button below. A faded/missing color indicates empty. As the electronics in the ink cartridge and the printer communicate with each other, sometimes the printer will incorrectly identify an ink cartridge as unrecognized or non-functional. 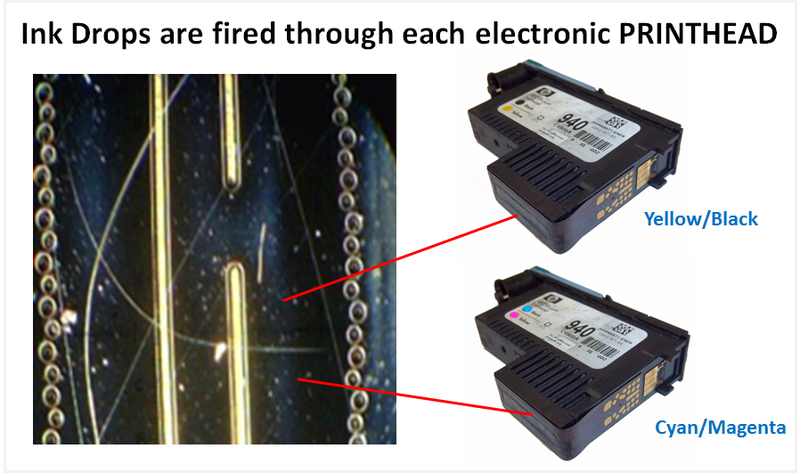 Following ink refill, if the HP 940 ink cartridge(s) is not initially recognized, then the check cartridge to printhead connectivity (remove and reseat the ink cartridges). If the problem persists then verify the HP 940 smart chip is present (see photo below for correct positioning) and ensure gold contacts are thoroughly clean. No ink residue should be on contacts – clean with lint free towel and isopropyl alcohol as necessary. 1. Press and HOLD the printer’s ‘Reset/Resume’ button for five (5) seconds. Instead of powering off the printer on the next print job attempt, try opening and closing the cartridge access door to see if the print job can be performed successfully. If it does, then this will confirm there is a probable cartridge connection (‘ordered detection’) issue or a possible printer driver ‘hand-shaking’ issue. Verify cartridge to printer connectivity (NOTE: if you have a mix of refilled ink cartridges and HP manufacturer/original cartridges in the printer at the same time, this can sometimes confuse the printer firmware from operating correctly). 1. Remove all four ink cartridges from printer. 2. 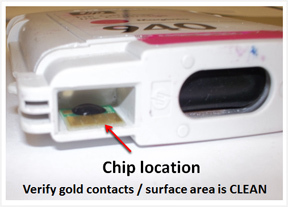 Inspect the smart chip contact surface (located in bottom/rear portion of cartridge). If there is any ink on the surface of the chip please clean thoroughly using isopropyl alcohol dampened lint-free towel, or similar. 4. After installing all four ink cartridges, retest printer. 5. If problem continues, then we suggest you press and hold the reset button on the printer for five seconds…this will reset the cartridge’s smart chip, and may correct the current ‘interface’ issue. 6. If the problem persists and a mix of refilled and HP original cartridges are determined to be in the printer at the same time, then it is suggested to either install all refilled cartridges or install all HP original cartridges to rectify the issue. If you observe “The Following Printhead Appears to be Missing or Damaged”, “Alignment Failed” or “The Following Printhead has a Problem”, then this type of problem is usually severe in nature and is typically caused by failed micro-electronics within either of the two (2) PRINTHEAD assemblies. 2. Remove the suspect cartridge(s) from the station. 3. 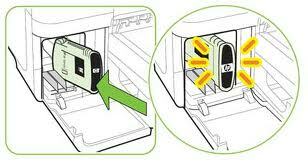 Re-install the cartridges in their stations at left side of printer. 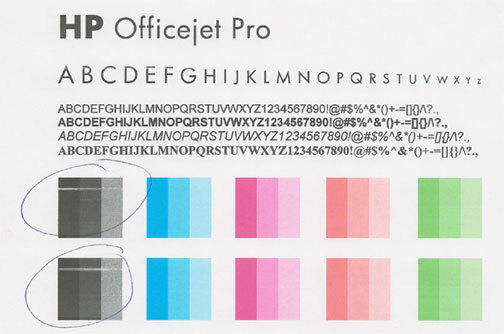 Step C: If printer errors persist or poor print quality cannot be corrected, then one of the respective PRINTHEADS might have a connectivity problem (i.e. dirty electrical contacts), may be out of warranty (at end of life) or has electrically failed internally and may need to be replaced. Remove and inspect suspect PRINTHEAD assembly. It is suggested to refer to manufacturer instructions for your printer model; the steps below are provided for general guidance only. 1. Open the top cover to access the printheads. The carriage should move to extreme left side of unit [if not, press and hold the ‘*’ (star) button on control panel until carriage moves all the way to extreme left of printer]. If not, power off printer, then power on. Repeat until carriage moves to extreme left side. 2. Lift the blue printhead latch to gain access to the 2 printheads. Remove and replace with new printhead assembly. 3. Lower the blue latch handle to securely lock the printhead assemblies into place (ensure the blue latch fully snaps into the locked position). 4. Close the top cover. Allow the alignment page to print; this will help confirm if the problem has been fixed. The Yellow/Black PRINTHEAD or Cyan/Magenta PRINTHEAD will eventually fail over time with usage and age. NOTE 1: A compatible/clone ink cartridge can be problematic as the smart chip (at base of cartridge) may not provide reliable printer-cartridge connectivity once installed. Compatible/clone ink cartridges are typically purchased on-line or at select retailers (i.e sold under a different label than the regular HP cartridge packaging). 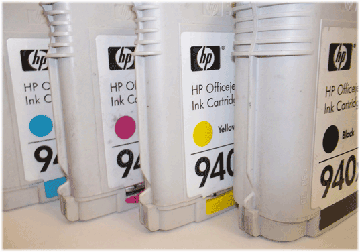 For the best refilling experience, only use HP original/genuine ink tanks (HP trademark logo should be visible on the side/front label of ink cartridge).